The Grades tool in eClass (or Gradebook) allows you to manage and organize a collection of grades in eClass. 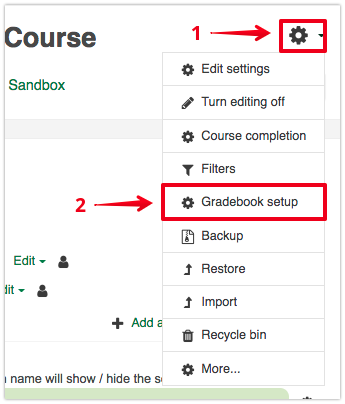 Items that have been assessed using an eClass activity will be automatically added to the gradebook (for example if you add an Assignment activity to intake student papers). Additionally, eClass will allow you to manually add grade items for offline activities such as TSQS-scored exams, class presentations, or participation. 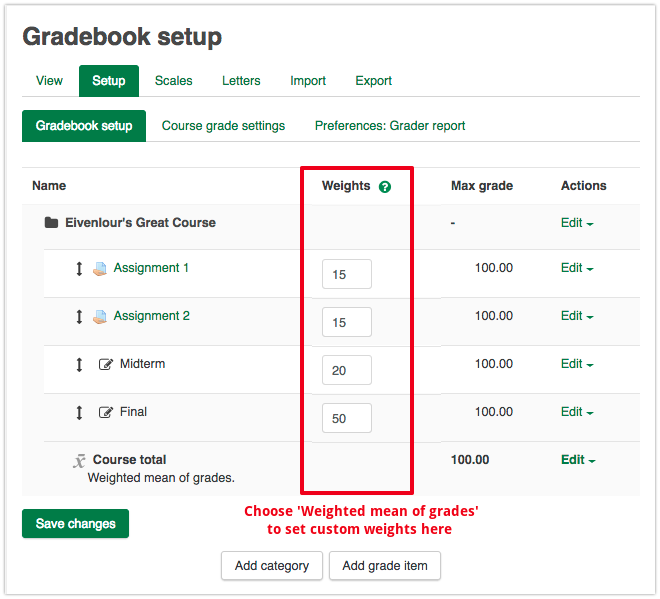 You can specify the method for calculating and weighting your assessment items and then tailor how these grades are displayed to your students. Click on the gear icon, then on Edit settings. Open the 'Appearance' area and ensure that Show students their own grades is set to Yes (default = Yes). This will allow students to access their own grades only. Click on the gear icon, then on Gradebook setup. This page can be used to build the structure of your gradebook. 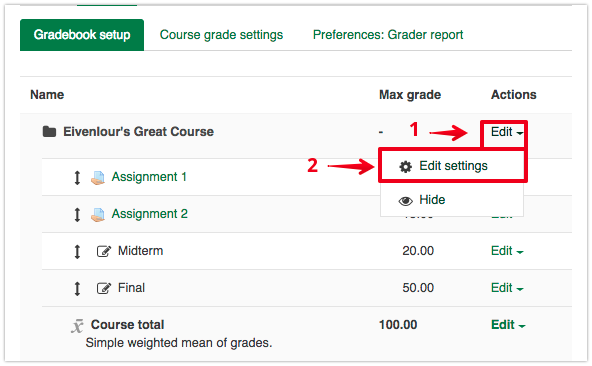 Activities (assignments, quizzes, forums, etc) already added to your course and given a grade in their settings will already appear as columns in your gradebook. The grades delivered through these activities will automatically appear in your gradebook. For quizzes, scoring is automatic; for assignments, you will need to provide scores and feedback for students by clicking the View/grade all submissions link in the assignment. It is recommended that you do this through the assignment activity grading interface as you have more options there. You will need to manually add any other assessment items you wish to include in your final score. To add a manual item to your gradebook, see Adding Grade Items. If you have a large class and plan on importing grades via spreadsheet (eg. from an optically scored exam) you can either create manual grade items in advance or on the fly during the import process. See the article Importing Grades into the Grader Report for more information. Note: Be sure to add basic course assessment items as Grade items not Grade Categories. 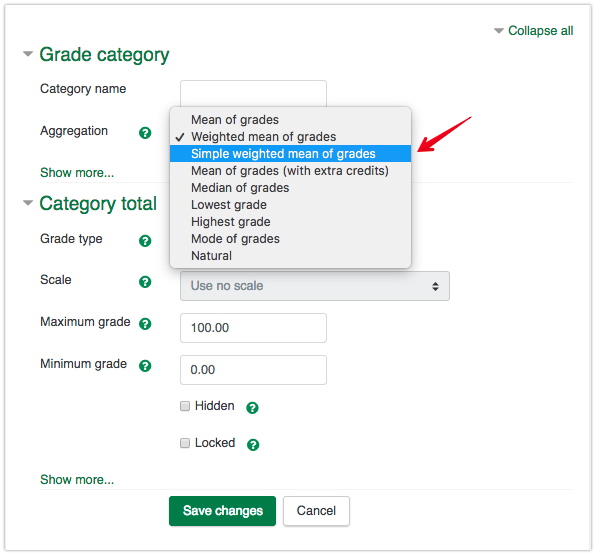 Using grade categories instead of grade items can cause problems calculating grades. Grade categories are used for internal organization of gradebooks by assessment type where more complex calculations are required (an example of using a grade category would be to contain all of a term's homework assignments where you are giving students their top 8 out of 10 scores and the overall weight is 15% of the term; an example of a grade item would be the mid-term quiz.) For more information see Setting Up Gradebook Categories. In the 'Gradebook setup' tab, click on Edit → Edit settings at the top of the table beside your course's name. On the next page, choose an aggregation method for your course in the Grade category section. 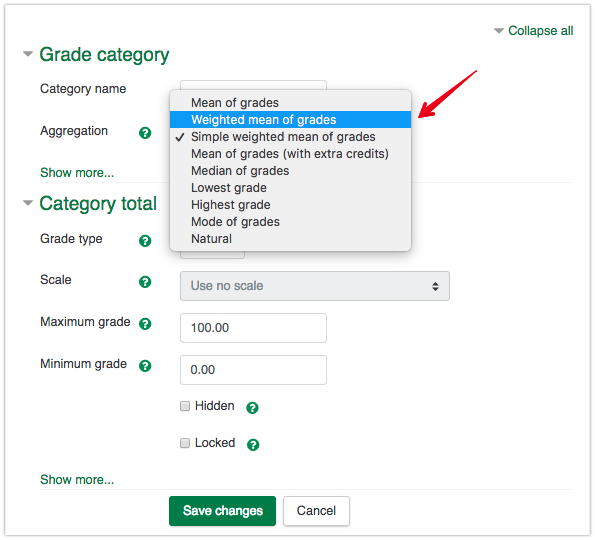 If you have set the maximum scores of your assessment items so that they all total up to 100, select Simple weighted mean of grades. You do not need to enter any further weighting information. If you need to scale certain items, i.e. give them a different weighting in the calculation of your final grade, select Weighted mean of grades. This will add a Weight column to the Gradebook setup tab. Enter the weighted value for each of your grade items and save changes. For information on the other aggregation methods or for making advanced gradebook calculations, see the article Calculating Your Course Total. Note: You do not HAVE to complete steps 2 and 3 at the start of the term. 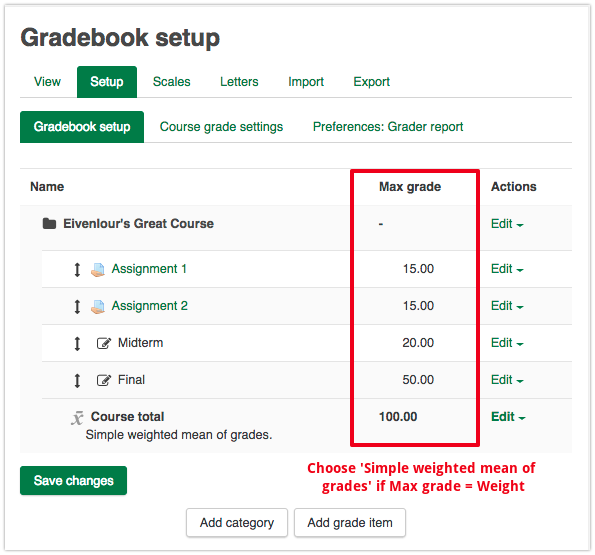 Grade items can be added to your course gradebook throughout the term and once all are present, the aggregation methods chosen to calculate the final grade. If you opt for doing this sort of setup on an as-needed basis, you should review the article Controlling the Visibility of Your Gradebook, and consider hiding the course total until all the assessment items have been added (so that students aren't confused by the 'running total').